Internet Ad Spend will Overtake TV Spend in …. Yawn. A couple of months ago, the same data from the PWC Global Entertainment & Media Outlook popped-up a couple of times in my Twitter feed. I meant to write about it then but I’ve got around to it now as part of my BEWA plan. The most re-tweeted factoid stated that, “By 2018, Internet advertising will be poised to overtake TV as the largest advertising segment” and concluded with the line “We are approaching a major tipping point in the advertising universe“. I’ve made a career out of Internet advertising for more than 17 years. I delivered my first online ad a couple of years earlier as an online companion to a traditional radio spot. When we first started these kinds of comparisons were helpful, not only to reassure us that we’d made the right career choice, but also to convince our bosses that this really was a growing market and they might help us by employing another person to help us figure out what to do. As an industry we were pleased when online ad-spend eclipsed various forms of print, billboards and even those radio ads I’d spent years working with. I acknowledge it’s an interesting barometer and makes for some nice graphs for somebody’s next ‘speaking opportunity’. But, today, comparing the vast opportunities of ‘Internet Advertising’ as a single place of ad-spend while breaking down ‘offline’ spend into it’s component segments doesn’t feel right to me. The IAB (using US-centric data) tells us that, in 2013, 43% of Internet advertising spend was search. Classifieds make-up 6% of the Internet spend. There seems very little point in comparing these numbers to television. (Much more significant for TV is the kind of spend-shift outlined in a Bloomberg piece about Nike, but that’s for another day). Surely, it’s connected vs non-connected advertising. The tipping point is coming but it’s not when Internet spend passes TV spend. It’s when spending on connected advertising surpasses non-connected advertising. I don’t have access to the whole PWC Outlook which may very well put these numbers into a more subtle context that 140 characters can not convey. Author jonPosted on August 27, 2014 October 17, 2014 Categories Digital AdvertisingTags advertising, bewa, digital, television, web3 Comments on Internet Ad Spend will Overtake TV Spend in …. Yawn. Links from 25th March 2006 featuring doing what you love. My Delicious link today is a piece by Paul Graham on doing what you love. Is it possible? Interesting site with somebody’s photographs. Then there are the blogs that disappear. Mike of Troubled Diva fame (who I was introduced to via the excellent 40in40) put the blog on indefinite hold at the beginning of December. 8Legs went the same way a few weeks later. And now Chris has packed up. I don’t know Chris nor have I ever mailed or commented his site but I read it almost religiously. Why? Well, he has a talent for writing to the extent that almost everything he wrote was compelling. It was his writing style which was an inspiration because, by the time I discovered his site, I had been writing this blog for a while. You know, I am really impressed by the new version of Opera (which has always been a browser I have used). You know, I am really impressed by the new version of Opera (which has always been a browser I have used). I love many features while others, like the new M2 mail client, I am not too sure about. I think they may have something in the different approach to mail but I may just be too stuck in my emailing ways. Still, if you want to check out how your pages may look on smaller screens (phones, pdas etc.) if the vendor has selected Opera then boot up Opera 7, go to your site and SHIFT F11 for Opera’s small screen rendering. Left is my site as it looked the other day. I think it proved the power of style sheets as the whole thing is still quite browsable (is there such a word) and readable in the reduced format. I may even browse all the web like this! Today I understood how the internet was built up and how it failed to deliver on those dreams for many people. What was sad were the changes that have happened to the online group over the last year. Gone are the product managers, most developers and many of the other staff. They are now much, much smaller than they were. I went to see a client this morning: nothing too unusual in that fact. It was a client I have worked with over several years – the internet arm of a well-known organisation. Again, nothing too exceptional. Nice chat, coffee and new product overview (from my part). As I had not seen them for a while, I thought it would be nice to go back. Now, don’t get me wrong, it was great to see people there. What was sad were the changes that have happened to the online group over the last year. Gone are the product managers, most developers and many of the other staff. They are now much, much smaller than they were. Again, nothing to unusual in this but today it struck me as sad. The ideas and the passion, the desire to make something happen and be part of it that all those people had – gone. How many people in so-called new media industries have been through it (some, several times)? I have been through the cut-back mill as people around me are “downsized” in order to allow companies to survive. Yet, today – I think – was the first day the scale of it struck me. I can’t really explain it and I am not sure that I want to try but today I think I understood how the internet was built up and how it failed to deliver on those dreams for many people. The “why” of it all is a different story for a different day. Today is about the good people who have moved on. Hopefully, they’re doing better. Ben Affleck in tight leather – why are you looking for those pictures? Looking at the referrer logs for this site, a lot of people are getting here thanks to my mention of Ben Affleck in tight leather (I assume in my Daredevil review). 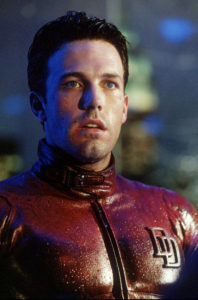 If you really want a picture of Ben Affleck in tight leather, go here, here or here. In common with any page of links, many of the pages noted below have long since moved, closed or cease to be updated in any regular kind of way. Facebook and Twitter have meant some of those who I used to read have moved on to the next way to communicate their thoughts. I keep this here as a nice remineder of the early days of blogging! Much of the information below is now well out of date and many of the site are no longer around. Independent Radio News’ site no longer has any of the original code behind it and Satellite Media Services went out of business a long time ago. See ex-sms.com a little bit more about that company. I’m leaving this page up, however, because it remains a valid history of some of the early websites I worked on. Since I have been online I have been involved in the development of a number of web sites. Nowadays, I do not work for a web development company so many of the sites listed here are not the versions that I was involved in. Some of them have developed well and some seems somewhat stuck and, dare I say, even basic. In 1994 I was working for Satellite Media Services. During the next two or three years we developed various versions of their web presence, including the online versions of IRN’s news service at The Radio Magazine. Now they have a new web address and much better design but don’t seem to develop sites for others any more. The Radio Magazine has a new web site that has absolutely nothing to do with me but it still makes good reading about the UK radio industry. Independent Radio News has also gone through several revamps. I can still see some of the code we developed behind this version of the site, and I suspect, the original audio scripts are still in place. IRON was one of the first sites in the UK to broadcast up-to-date news in RealAudio format. At the time, Satellite Media Services was partially owned by Capital Radio plc and were responsible for the original prototype of Capital Online. Capital’s web services have moved on dramatically yet remain some of the best entertainment web sites around. My original personal sites were based on the SMS servers and there remains no trace of them anymore. They were moved to various free space until I placed them here. The original UK Radio Information Pages were also based at SMS. They then moved to Onair before I removed them. James Cridland and the Media UK team do I much better job than I was doing. SMS, back then, was a satellite audio distribution company. Back in 1994 I used to produce a site featuring a range of photographs of SMS’ satellite dishes which became a something of a cult site for a while (I know, the whole thing was very strange). Media UK also became the host of those pictures but, somewhat wisely, they seem to have removed them. The next few web sites I was involved in are no longer in existence. Events Online, one of the UK’s first events listings services has long since vanished. It was an idea ahead of its time. For something similar, try Scene One (link now obsolete). A number of other sites were developed around that time. Fruit Machine is still an idea and I did some of the scripting work behind the original Alternative Holidays site (working with Kevin from Incline Media – one of the best web productions houses around). The last commercial web development I was involved in was at IPC Magazines (now IPC Media). Yachting and Boating World still has massive amounts of content behind it and, if you have an interest in sailing, why not pay it a visit? I had great fun working on the development of all these sites. One day, I think I would like to work with content again (rather than software) but for now I am happy to be away from the struggles of generating commercial content.